Welcome to the Natural Hoof website, where you'll find information and resources about Barefoot Trimming & Natural Horse Care. BOOKS HALF PRICE OR LESS!!! WHILE STOCKS LAST!! Order Online Today! Discover the importance of a balanced, natural hoof shape. Natural Trimming is based on the natural hoof shape of wild horses, combined with years of scientific research, for enhanced performance over all terrain, and/or healing of common hoof problems. Information about how to provide a natural environment that will enhance your horse's health and wellbeing. 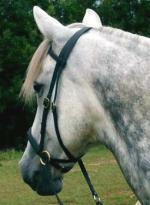 Important research into the horse's diet, minerals, herbs, essences and homeopathics. Riding gear that will not harm the horse, and classic riding styles that are sympathetic to the horses anatomy and physiology. SPECIAL! NoBit Pony Bridles $50 off! Visit Our Online Shop for details. Users of our Bitless Bridles say . . .